I've said it before and I'll say it again: fruit rocks. Click here to play! Case closed. But you probably already know that. If you enjoy fruit as much as I do then you'll no doubt want to play Fruit Slots; it uses the finest in tropical and exotic fruits to win you money. And the best part is that it's an easy-to-play 3-reel, 1 pay-line game! 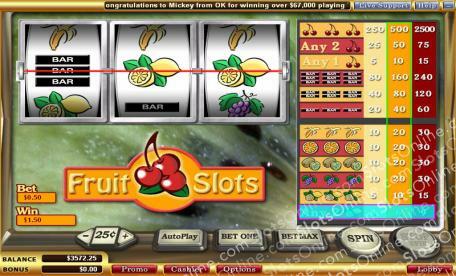 No need to be distracted by Bonus games and multi-line slots, in Fruit Slots there are more than enough ways to win. Like all great traditional slot machines, you can increase your payouts by betting up to 3 coins on each spin. The ultimate prize is landing 3 Cherries - was there ever any doubt? - which will grant you 2500 times your original bet, providing you play with 3 coins. Forget vegetables, fruit is obviously the superior nutrient. Just ask yourself: will a stick of celery ever give you a cash prize? I doubt it. Stick to Fruit Slots.